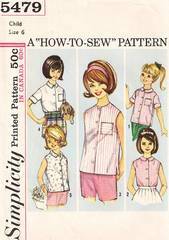 "How To Sew" Simplicity pattern includes tissue chart for "How to attach collars". Blouse may be worn as an overblouse or tucked in. All views had front button closing, darts and high round neckline with openings in lower edge of side seams. Roll collar, flat collar or collarless. Sleeveless or short cuffed sleeves. Optional patch pocket. Girls' Size 6; Breast 24; Waist 22; Hip 26. Pattern is complete, meticulously cut and folded. Envelope and contents are in excellent condition.